Always refer to your own EM senior for advice. Note clearly that you expect them to admit the patient. Please note time / who you bleeped and referring to. Please remember you are referring for admission, not an opinion. If the receiving doctor wishes to admit or discharge, that is up to them to decide once they have seen the patient and made a clinical note. Admitting teams should not be asked for an opinion (ask your EM senior) as this promotes patient ping pong and is detrimental to their care. In patient teams in CUH. If a patient presents to the emergency department and is deemed to warrant admission to the medical/paediatric/surgical on-call service then contact with and referral to the appropriate on-call team should occur without delay. Refer to the in-patient SHOs for advice - NOT opinion (should refer to your senior or the relevant registrar). The National target time of 1 hour for review by specialist teams in any emergency setting (ED, AMAU, and ASAU). The CUH EMB endorsed this position in 2018. Clinical ownership of patient must be clearly defined at all times. Once called to review a patient, the team take over care once they have indicated to the ED team that they have done so. If the specialist team orders investigations the patient will be deemed to be under their care. All teams should conduct their interaction with the patient in a manner which minimises wasteful delays e.g. deferring decisions regarding takeover of care until particular imaging is performed. Once specialist teams review patients, they must communicate their decision clearly in the notes as well as verbally to referring ED/AMAU/ASAU doctor and nurse. If the referring doctor is no longer on duty, the communication must be with the most senior doctor covering the relevant area. Accepting the care of a referred patient includes accepting responsibility for following-up the results of any clinical investigation commenced in the ED prior to referral. If there is any dispute between When requesting admission essential to write the request on the ED card and indicate which doctor (e.g. name of Surgical Registrar) you wish to come and see your patient. ALL referrals from the ED are to be discussed, in advance, with an ED Reg/SpR/Consultant. This will continue to allow senior decision makers the opportunity to identify patients that may be suitable for discharge and/or alternate care pathways, thereby mitigating the need for admission. Additionally, the interaction can be a training opportunity for staff that are new to the ED mindset. Mon-Fri (8am-5pm) referrals are made to the AMAU medical staff. Referrals are made thereafter to the Medical Registrar on Call (MROC). Resuscitation referrals are made directly to MROC from 9am. EM SHOs can refer to AMAU/MROC provided the referral has been discussed with the duty EM Reg/SpR/Consultant. MROC will take referrals of all patients in Resuscitation. MROC can designate ONE specific senior Medical SHO to accept referrals at times when MROC is managing patients in Resuscitation and/or at times when they are not in the ED. When necessary (eg due to the complexity of the referral), the ED Reg/Spr/Consultant will liaise directly with AMAU/MROC. The Medical team on call will admit patients for the Cardiology service (out of hours) who present with chest pain only and have a TIMI ≥2 who are not STEMI or NSTEMI. The Cardiology Registrar on Call does NOT need to be contacted out of hours for these patients. The Cardiology Registrar on Call can be contacted at any time to discuss any cases deemed necessary by the EM or Medical senior. This update was agreed by the Clinical Director, Dr M O’Connor, EM Consultant Dr C Deasy and the NCHD Co-Leads Dr Liam Healy and Dr Ruth O’Riordanon 01 March 2016. Prof paula O'Leary is taking up the UCC medical School Deanship in August 2018. She will continue to provide specialist Immunology consultation within the scope of her availability and resource. She will continue to provide care to existing immunology specialty patients attending her for out-patient and inpatient specialist opinion and investigation and treatments. New patients will be considered on a case by case basis. Please discuss with her directly preferably by phone. Note where the patient lives and if we are not the local hospital refer for follow-up to the local Emergency Department or their GP. Provide the patient with a photocopy of the notes. It is important to give relevant X-rays to the patient and to record that fact. All children with CF should be referred immediately to the cystic fibrosis or paediatric doctor on call. In-hours, the The Paediatric CF nurse can be contacted on 087 9683245. Dr Muireann Ní Chroinín 17/06/2008. Do not send an electronic referral from the Emergency Department. For Self-harm/Suicidal, Monday to Sunday (08:00 – 20:00): Contact the Self Harm “Crisis Nurse” CNS. Tel: VPN 65327/65324/92110. There is no on-site Child and Adolescent Mental Health service at CUH. Contact the relevant sector Child and Adolescent Mental Health team (depending on the child’s address). If you are unable to get hold of anyone or require signposting to the appropriate sector CAMHS team, contact the On-Call Child Psychiatrist (see below). Contact the On-Call Child & Adolescent Psychiatrist: Tel: 086/4102646. In MUH, please complete the Physiotherapy Referral Form. Please complete a Referral form for patients in the CDU requiring other specialist opinion. Patients who are undergoing orthopaedic treatment who present to the ED with ? DVTs will be seen and treated by our orthopaedic colleagues. They will then refer on to the medical team if necessary. (Mr Mullan letter Sept 2004 Here). Elderly patients who sustain pelvic fragility fractures secondary to an acute medical event (e.g. CVA etc.) should be admitted under the general medical / COTE team on call. Patients with pelvic fractures secondary to a trip or slip with significant social or psychological issues should be admitted, under the orthopaedic team, for appropriate referral to social worker, discharge co-ordinator and occupational therapist. Patients who have fragility fractures without social issues after initial assessment by the orthopaedic team may, following appropriate investigations, be managed in SIVUH or MUH. 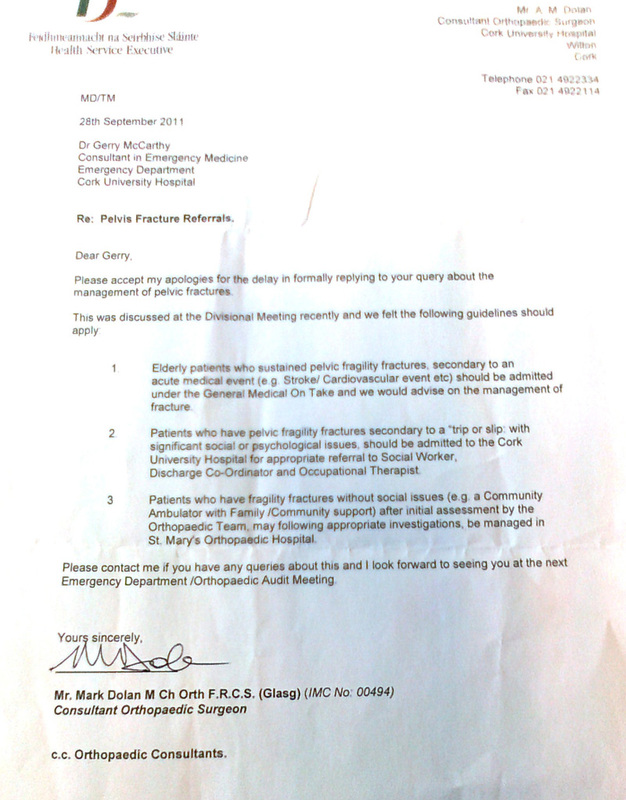 Mr. Mark Dolan Orthopaedic Division letter 2011. After 5pm – on-call mobile – 087 6752981. All referrals for admissions should be phoned through to Paediatric Registrar. Paediatric SHO may admit patient. All grey cases should be discussed with EM SpR/Consultant prior to contact with Paediatric Registrar between 8am-5pm. After hours, PEM SHO to directly discuss all < 1 year old & grey cases directly with Paediatric Registrar on call prior to discharge. In absence of PEM SHO, *EM senior to review all under 1 year old (>3 months age). Strongly consider Paediatric Registrar review of infants between 3-6 months of age. ALL infants < 3 months of age presenting to the PED out of hours to be seen by EM SHO and must then be reviewed by Paediatric Registrar on call. In the absence of PEM SHO, all grey cases to be discussed by EM SHO with *EM senior prior to contact with Paediatric Registrar. Low threshold for EM Senior to discuss infants > 6 months with Paediatric Registrar on call. Patients referred from EM staff to relevant teams before 08.00 will come under the care of the team who was on-call the night before and all patients referred to relevant teams after 08.00 will come under the care of teams on-call that day. Hard copy. Surgical "handover" is at 07:30. All referrals to the surgical service, made before 07:30 will be seen by the team who were on-call over night. Those referred after 07:30 will be attended by the day team. 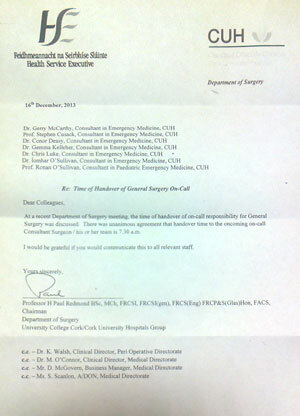 ALL general surgical referrals should be made to the on-call surgical team. The on-call team will attend the patient and either admit themselves or transfer care to another (e.g. previous OPD attendance) surgical team. Content by Dr Íomhar O' Sullivan. Published 02/03/2004. Reviewed 09/12/2006. Last review Dr IOS 13/11/18.